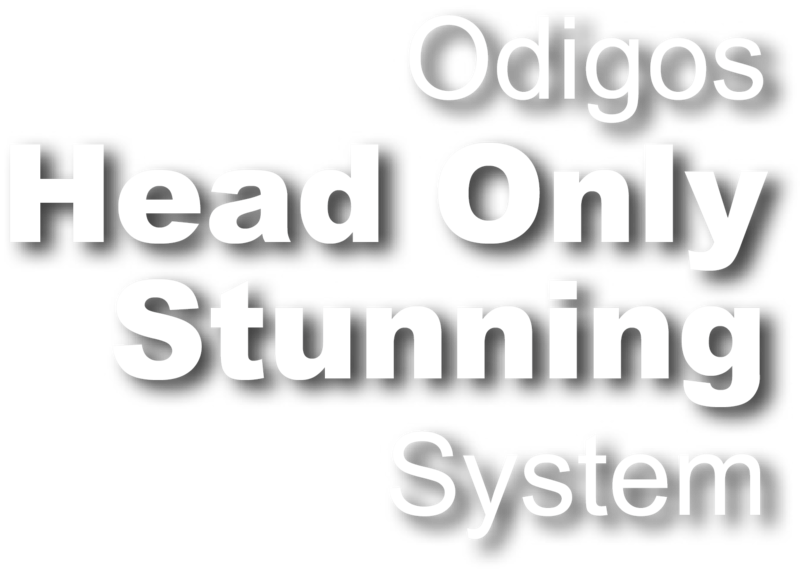 The ODIGOS Head Only Stunning System™ is based on a completely new principle of positioning, stunning and shackling birds in poultry processing. Scientific research has proven that this procedure ensures that the animals remain calm and display no stress or excitement. The birds are kept in a cone shaped holder which prevents them, before stunning takes place, from experiencing any type of stray current or other sensations which could cause unnecessary stress and pain. The principle of the stunning system is based on natural poultry behavior. The heads, of both larger and smaller birds, are positioned in such a way that they are accessible by the “head electrode”. The slaughter shackle runs parallel behind the cone in order to be prepared for the moment when shackling needs to take place and also simplifies the shackling. During the positioning the legs will reach an opening in the shackle so that the bird is not yet attached to the shackle to prevent unnecessary pain. The birds arrive at ODIGOS via a carousel, containers, crates, or conveyor belts and are put in the cones in a gentle, animal friendly way. The transport rail takes them to the point where stunning takes place. Before stunning, the heads are moistened by spray nozzles to ensure optimum conductivity. The actual stunning is done by electrodes which are automatically placed next to the bird’s head and are activated during max. 3 seconds. The electrodes are designed in such a way that the stunning process is constantly monitored. The monitoring is done per bird and per second and can be followed on a screen. Per bird, this data will be stored in a computer file. The plant manager or the plant veterinarian can check these data at any time during the day and if needed, this information can be stored on a data stick or computer hard drive. Birds which are not or only partially stunned will ignite an LED light signal that runs synchronically with that particular bird. These birds come to the attention of the machine operator, allowing him to take action by removing the bird from the shackle or manually stunning it. The time span between stunning and killing can be adjusted in order to be in compliance with government rules and regulation. It is possible to program different interval times depending on a particular line speed of the moment. This ensures a high flexibility in operation. After the birds leave the ODIGOS Head Only Stunning system™ they continue the normal slaughter process and the next step will be to go through the correct bleed-out process. Topkip’s patented Stunning Technology is the only method in the world which meets the strict Halal slaughter regulations. This enables advanced poultry slaughter companies to broaden their scope of activities into Islamic regions.